Lynn wrote: Yes it makes sense to change it. All along I have not understood why they used their temrinology "accessory II" for main headline. I / we always thought that the main headline should be II and the part joined to the heartline should be accessory II. Okay, nice to hear that you recognize how my proposal makes sense. But more important... do you also recognize that your problem (related to how to apply the length criterium as described by figure 5C, to the Suwon crease) is solved by my proposal? I'll leave you two to develop the "VanMensvoort Improved Analysis of Palm Creases" My video crew is heading over to continue work on my presentation for the IBMBS presentation and I need to give that my undivided attention for a while. Yes Martijn I recognise how it makes the length requirement more sensible. However in making these changes, we are using a different vocabulary to the researchers. I feel sure that normally you would never advocate doing such a thing! I'll leave you two to develop the "VanMensvoort Improved Analysis of Palm Creases"
Good luck with your video presentation Patti, hope it goes well. Lynn wrote: Yes Martijn I recognise how it makes the length requirement more sensible. Okay Lynn, thanks again for your feedback. Yes you are right... I would not advocate such a thing easily. But I am not really introducing a 'different vocabulary': because if the researchers had not used the word 'accessory' in their two examples for the Sydney line and Suwon crease, I think we would not have been confronted with this problem at all. Because in their writtings they only speak an: "... accessory II", which could be read as a '... a second II'; but we - in our discussions - started talking about 'accessory II', while the researcher have not done that explicitely. Afterall, it tooks us about 9 months to find the clues provides in figure 5C... and some of us have read the details in the article over-and-over again (I am thinking about Patti). So, I think we should make the Korean article more important than it really is. Their name 'accessory II' for a normal head line, and 'accessory III' for a normal head line... could easily be described as a servious fundamental mistake in their vocabulary... and I think this explains why their definition of the Suwon crease is so confusing... that some of use here think that they are observing Suwon creases in many hands (I am not only thining about Patti, others have also presented examples of relatively common hand line variants... which they assumed that it could include a Suwon crease). For me, after being confronted with the problem that you described earlier today - directly resulting from their guidelines for the accessory crease in fig.5C - I could even speak about a CLEAR 'contradiction' in the Korean guidelines. - Because by fact, in figure 3 they have defined the Sydney line as: 'II+III' plus accessory III, illustrated with a picture which shows a Sydney line compose by two line parts which each clearly have a different structure. - But in figure 4 they have presented their no.1. Sydney variant as just one 'extended head line'. It would have made more sense it they had presented their 'Sydney 2' variant as the no.1 variant - because only then that would confirm the Sydney line formula. And finally... that they also sort of re-defined the Sydney line in this article: by describing it with the formula:'II+II' plus 'accessory III. They should have mentioned that this concerns a RE-DEFINITION of how a Sydney line can be understood properly. However, I also would like to add that I really do admire their efforts + their new method. But unfortunately, from my point of view... after 9 months of discussion their vocabulary has not survived the 'test of time'. Simply because it is rather confusing in how they used the term 'accessory crease' in the perspective of both the Sydney line and the Suwon crease. Anyway, I will continue to use their method to discriminate a simian line, from a Sydney line and a Suwon crease... but now it no longer makes sense for me to continue using their 'accessory' concept for a normal head line and a normal heat line. Because obviously, they have followed the classic approach for defining an 'accessory crease' (described in figure 5C)... but then they did have not succeeded to INTEGRATE that classic approach properly in their new concepts for both the Sydney line and the Suwon crease. Let's hope that, if the Korean re-definitions are adopted in new studies... then we should hope that the researchers will not follow that aspect of their Korean vocabulary. Anyway, great to know that that my 'proposal' does make sense for you... but I don't expect any new problems. Instead, this actually solves a significant part of the problems that we have been confronted with in our discussions so far! IIIa = accessory heart line. An advanced system, but still: the elements are quite simple... exclusive, and the combinations make sense! Am I right? If not, what kind of line might it be? I will try and post a better picture in daylight tomorrow. What is the meaning of such a line? 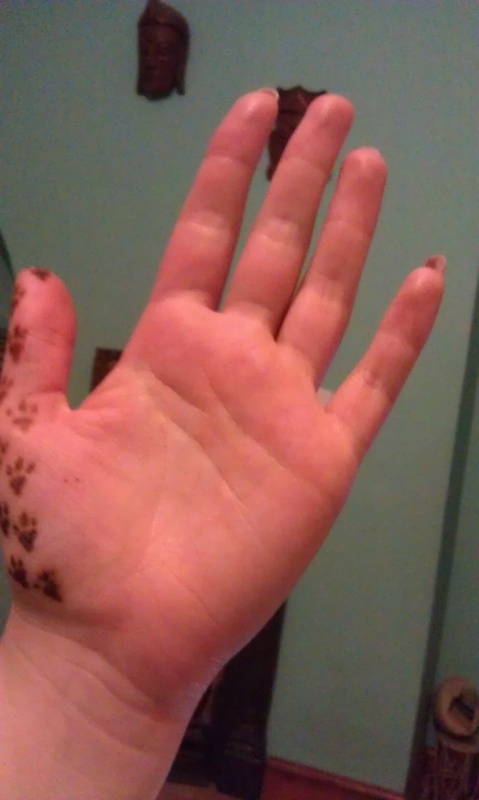 ... via the photo below (I discovered at your 'henna art collection') it appears that the upper head line is connected with your heart line, and it appears that both head lines are not connected with eachother (because they appear to cross your life line at two different locations, and beyond those points I see no connection). Therefore, if a study of the details would confirm both observations... yes, then I would classify your left hand as a Suwon crease. Interesting... thanks for posting your hand! Any idea what the significance is of a suwon line? Yes, both pictures confirm earlier observations (though the connection between the upper head line and the heart line is quite weak). Regarding the meaning of the Suwon crease, so far I have seen in more often in people with high educated people. But there could also be a link with an interest for 'technical' matters, and the orientation might become less focussed on social experiences. But these are only 'speculative associations'... (based on only about 5 cases). PS. Please be aware, nobody has researched this line very well. And despite that some palmists (outside this forum) already started sharing their 'ideas' in terms of theoretical interpretations. But I also observed that quite some people experience serious problems to understand the concept of this line properly, so be aware... any speculation about it's meaning could very well be based on a misconception about the requirements for recognizing this line. Yes, I would call it a Suwon crease. The fact that the upper head line is thinning as it reaches the heart line is a confirmation that it is directed from the radial side toward the ulnar. Your artwork would imply to me that you have flexible hands and excellent fine motor control. Are your thumbs particularly flexible or double jointed? My fingers bend back to a 90 degree angle but I don't have double jointed thumbs. On page 106 in John Manning's Finger Book It shows the hand of a Brazilian football player and I am sure it is has Suwon crease. 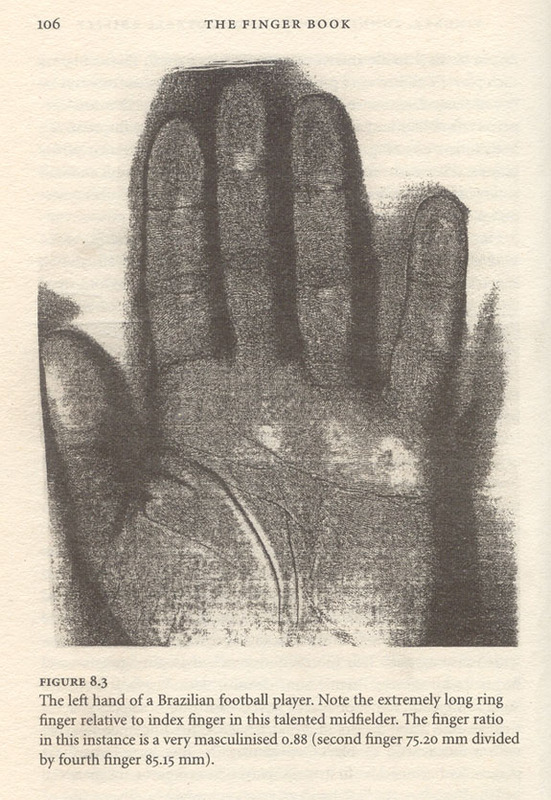 jeanette wrote: On page 106 in John Manning's Finger Book It shows the hand of a Brazilian football player and I am sure it is has Suwon crease. - Is the upper head line connected to the heart line? - And is the upper head line not connected to the life line? IF the answer to the first question is a 'yes', and IF the answer to the second question a 'no'... then Manning's example can indeed be described as a Suwon crease. Thanks Martijin for the reply. I know it is unclear but I stared and stared at it and, maybe convinced myself, the answer to the first was yes and the answer to the second no. That is the footballers left hand. 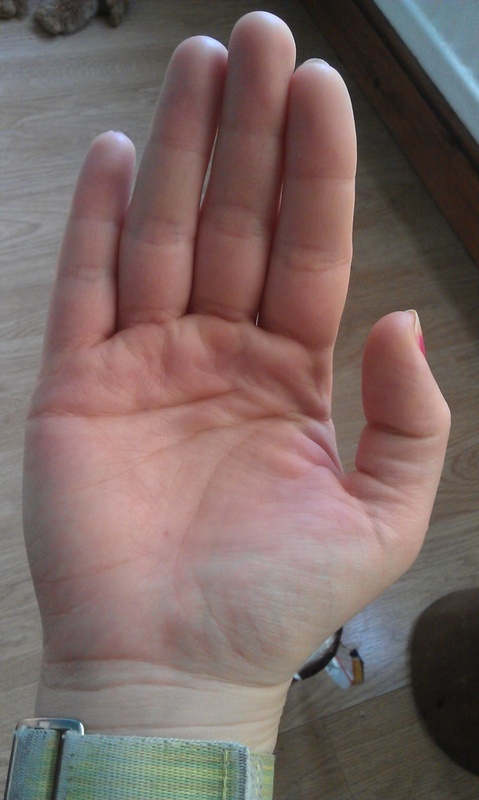 Do you know does the suwon crease appear mostly on the left hand. It says he is a footballer, but if he was a goalkeeper would it have stated that or does footballer mean goalkeeper as well. I was wondering about this when remembering what Patti said about the grip and he would be good at gripping the ball and saving goals. Martijn (admin) wrote: - And is the upper head line not connected to the life line? There is no requirement mentioned in the report regarding the upper headline being separated from the life line. Many people are trying to figure out what this little line really meant. My conception based on scientific analysis is -definitely presence or having of ‘dual personality or dual behavior’ in a person. You can say “A highly alert, prideful person who possesses dual personality”, if present on both the hands. If only on left hand the person has discarded the particular nature. If found only on right hand the person still under the impression of dual personality. By ‘dual personality’ I mean a person consisting or having more than one behavior patterns decidedly dissimilar in aspects or qualities. For example: like the office of a clergyman is twofold; public preaching and private influence. I know two ladies who have this mark on their palms of the hands are really miser, ruthless, direct, no hesitation, even cruel to outsiders they think they probably will have nothing to do with them in future. If they are powerful the gentleman will prey to their whims. They inclined to take undue advantage. This also shows lack of generosity. They are prideful. They ask many questions. Clingy and stingy. On the other hand, the same person behaves in pre decidedly different ways, obviously with more compromised humanitarian and sympathetic way at home or with whom she loves or fears. Here they are liberal because now the original Head Line will work which is joined with Life Line. The upper small Head Line will make her stingy the lower liberal. I was trying to establish combinations between the Mounts and Lines. The reason for reaching to this conclusion is this that this line reduces the gap between the two major lines. There could be many meaning relating to this line. What do you think? I would like to know. Thank you. Parender wrote: The reason for reaching to this conclusion is this that this line reduces the gap between the two major lines. I agree Parender that this is an important element of these combinations of joined head and heart lines. 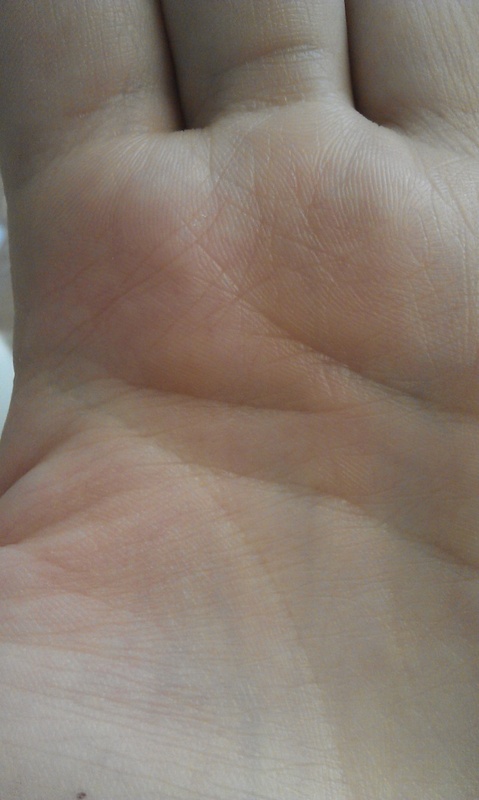 jeanette wrote: ... Do you know does the suwon crease appear mostly on the left hand. It says he is a footballer, but if he was a goalkeeper would it have stated that or does footballer mean goalkeeper as well. I was wondering about this when remembering what Patti said about the grip and he would be good at gripping the ball and saving goals. So far I have seen it more often in the right hand - but that could very well be just coincidence. Basically, it can manifest in both hands... but usually in one hand only. Yes, goalkeepers are included in the category 'footballer' (but the chance that this Brazilian footballer is a goalkeeper is probably only about 10%... but let's not waiste our time on that aspect because we will never know which position he plays; we better assume that he is not goalkeeper). As I suggested, variations of the Suwon would be presented over time. Here is a recent Indian report which illustrates 4 variations of the Suwon. 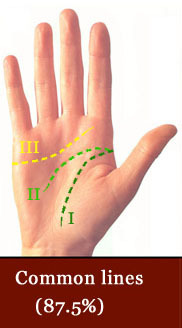 1) A branch leaves the heart line under different fingers. 2) Branch neatly mergers into brain line. 3) Branch just cuts fate line but does not touch the brain line. 4) Line drops at the start of brain line. 5)Branch line goes deeper into the area of lower mars cutting all main lines .........and so on. A sharp razer like branch that falls from heart line under Saturn directing to the origin of life and brain line was termed by Pamela as BOD line( reflecting business potential) line.Lynn ,Patti and Martijn might remember it. Should all above variants be grouped into "Suwon crease" ?? Is this suwon line example? The answer to your question is no, because the Suwon crease concerns a line which reaches the (thumb)side of the palm without crossing (nor cutting / merging) any other major lines. Will you please tell me its character in your own words ?